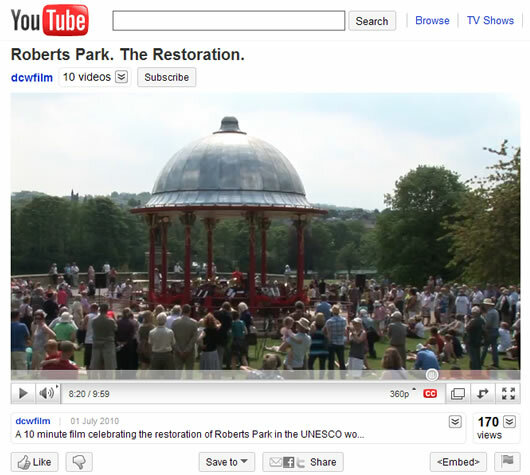 | Home | Saltaire History | David Weber's film on the restoration of Roberts Park. In 2009 these plans came into fruition and work began on the park. My good friend and well known Saltaire historian Dave Shaw and I had discussed the possibility of a short film to record the work on the park and bring news of the restoration to a wider audience. YouTube along with web sites such as Facebook and Twitter are the media and communication phenomena of our time and the audience potential for these sites is literally worldwide. I’d already been experimenting for some time with short films on YouTube so we planned to produce a 10 minute film on the park to post on to the YouTube site. The script was fairly straightforward and set against the backdrop of the larger picture of Saltaire would be a straightforward telling of the park’s concept, history and current status. Dave and I contacted Erika Petersen from HTLA (Hillary Taylor Landscape Associates Ltd) and she was particularly helpful in providing information and images for the film. Over the spring of 2010 I began gathering still photography and video footage and by the end of March began editing the film, always the most critical part of any film production. The voice over had to be just right and the obvious choice was Steve Nicholson who has worked on several Barleybrook films (The Story of Saltaire. Undercliffe. Echo of the Stones) His voice is particularly suited to this type of documentary film. The voice over took a day to complete and I was very pleased with the result. I’d thought about a classical piece of music to accompany the film but bearing in mind the magnificent new bandstand it really had to be brass band music and I think this has worked very well. In the present climate of doom and gloom it’s great to see a gleam of sunshine in the form of this project and on behalf of the residents and supporters of Saltaire I’d like to mention and thank the following for having the courage and foresight to undertake the restoration. My main aim has been to produce a film that is informative, entertaining and uplifting and will also help to promote this superbly restored park. I hope people will enjoy the film and that it will encourage locals and tourists to visit and enjoy this splendid park. Note from webmaster: David Weber is a film maker and is also responsible for the film, The Story of Saltaire. 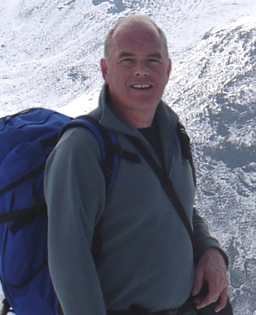 To find out more about David's films, visit the Barleybrook Films website.